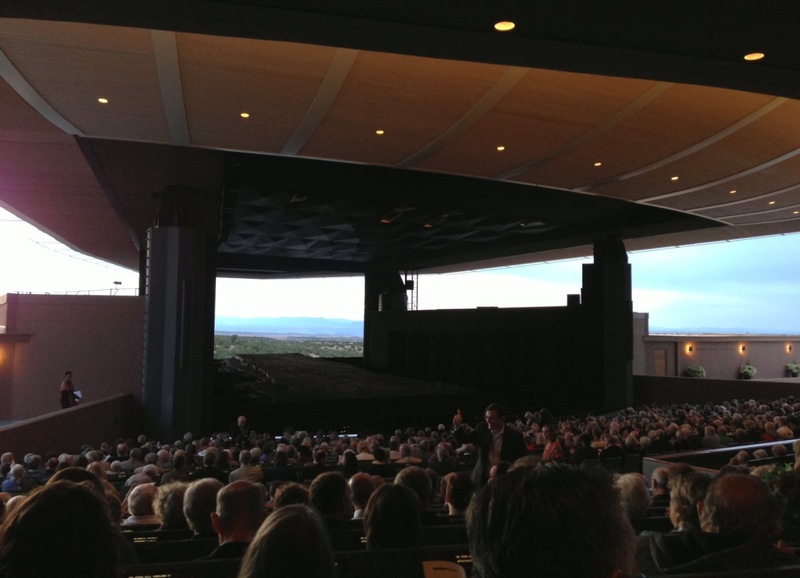 Last week in Santa Fe I didn’t just eat gelato (though I did plenty of that – oh stracciatella, how I miss thee); I soaked up much of what Santa Fe has to offer, including a night at the Santa Fe Opera. 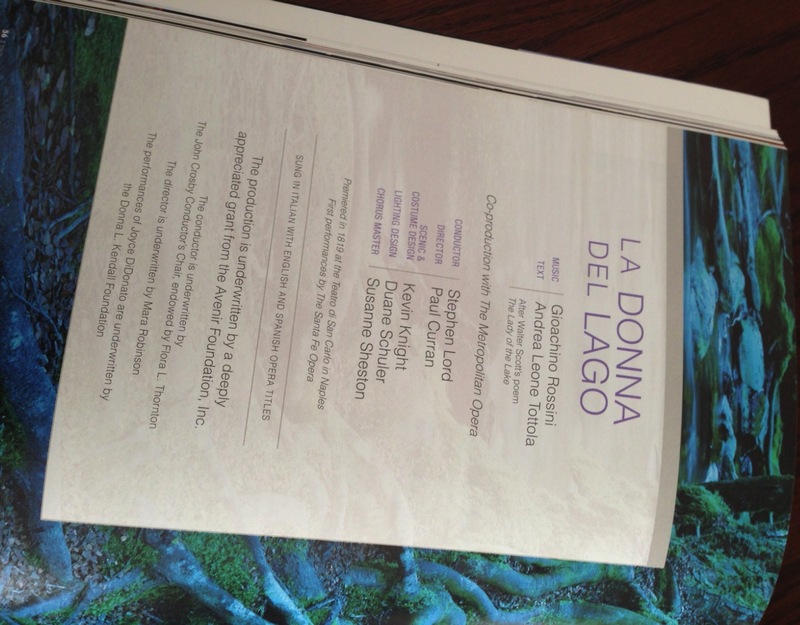 My father, N and I attended Rossini’s La Donna del Lago, starring Joyce DiDonato. I was excited to see Joyce live, both because she’s a beloved former student of my teacher George and because she’s a great advocate for opera who reaches out to the public in various ways including her blog. It was a thrill to hear her virtuosity and musicianship; all the singers were excellent. Operas at Santa Fe are a magical experience, especially when the sun sets over the red, juniper-dotted hills behind the stage during the opening scenes, or when real lightning snaps across the distant sky during a moment of intense drama. But, while its music was completely delightful (lots of great wind parts and wonderful, showy Rossini vocal lines), the opera’s story was boring. Like a majority of operas, it had a pretty dumb plot, and in La Donna nothing much even happened. Comic operas may have preposterous dramatic devices but at least they’re generally entertaining. Tragedies and romances, on the other hand, can be pretty darn static. Several years ago I saw Santa Fe’s production of Strauss’s Daphne. It was the most beautiful music I’d ever heard (and Erin Wall was incredible as the title character), but I found myself wishing they’d done a concert version because there was so little to work with dramatically. I’m not sure why it finally dawned on me this time, but as I sat there it occurred to me that in the 18th and 19th centuries a boring plot wasn’t necessarily a bad thing. Before our modern concert-going etiquette was established, audiences talked among themselves, walked around, and played cards, perking up their attention for the big arias. The reason we find some operas tedious now isn’t just because our TV and Internet culture has reduced our attention spans, it’s because we’re expected to be quiet and attentive through all 3 or 4 hours of an opera that wasn’t written with our kind of audience in mind! It’s understandable that many members of the public don’t want to shell out $50-$100 to sit perfectly still and quiet, with other audience members shooting daggers at them should they dare to clap between movements, cough, or (heaven forbid) unwrap a candy to stifle that cough. I think about this a lot, about how to inject some of the causal atmosphere of past eras into today’s performances, to make this old music not a museum piece but a living, evolving performance art. Of course, as a performer I don’t want people chatting or playing cards while I’m putting my soul to voice and delivering the culmination of hours of preparation. are controversial in the classical world, but maybe we shouldn’t be so quick to dismiss them. If someone watches this video, then looks up Monteverdi on Wikipedia and decides to listen to more of his music, isn’t that great for classical music? If Monteverdi, musical revolutionary that he was, were alive today, would he possibly even dig that electric guitar? A cellist colleague of mine recently started a Facebook discussion about concert wear and whether it was time for male musicians to stop wearing anachronistic 19th-century formal garb (tuxedos) to work and come up with something more modern and approachable for audiences. For decades people have been saying that classical music is dead, and somehow it lives on. There will always be a small percentage of the public who love classical music and are willing to pay for it, but I think we’re not doing our job as performers if we’re content to play only for them. It seems like a self-indulgent profession if we don’t at least try to reach out to new audiences and to make our music more accessible and affordable to them. To me this challenge isn’t a frustration; it’s an exciting opportunity to play and experiment. I’d love to know what you think of this issue, and your ideas for keeping classical music continually relevant. Please leave me a comment and vote in the poll below.